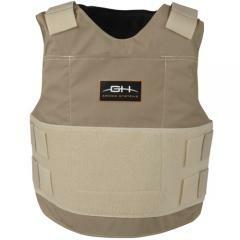 GH Armor Systems GH Flex Level 3A Concealable Body Armor FREE SHIPPING! Stay protected, comfortable and ready to act while wearing the GH Flex Level 3A Concealable Body Armor from GH Armor Systems. Constructed from 100% Aramid, the vest offers the highest level of protection and flexibility possible. The vest's composite fabrication complies with NIJ 2005 Interim Standards and has been proven to protect against Winchester 9mm SXT and SPEER Gold Dot firearms. A removable soft trauma plate adds the GH Flex's already impressive protection strength for further peace of mind. An internal desiccant helps control sweat and moisture for greater comfort during extended wear and long term operations. A cool-mesh liner encourages air flow and breath-ability for even further comfort. ©2002-2019 CopsPlus.com: GH Armor Systems GH Flex Level 3A Concealable Body Armor FREE SHIPPING!